Easy yeast free naan bread recipe, Punjabi roti recipe, indian bread recipes. Naan bread recipe is one of the popular Indian bread recipes served in restaurants. 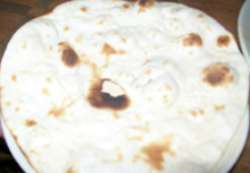 Nan is a roti(flat bread) recipe from the north Indian state of Punjab. My yeast free naan bread recipe given below is easy to make at home. Tandoori Naan(also spelt as nan) is made using plain flour and is baked in big barrel sized mud ovens called Tandoor. Apart from plain nan, butter naan, garlic naan are also made. The shape of the naan is generally oblong or oval. Though it is a flat bread, it is shaped by hand instead of using a rolling pin. Naan is served with curry and raita. You can also make nan in oven but I find it quicker and easier to make nan on the tava/girdle. Naan should be eaten hot. Naan is served with curry and raita. There are many naan recipes. Some of these use yeast to raise the flour. This naan recipe is the one I usually use and this is yeast free naan recipe. I find it easy and my family loves the naan bread made this way. I am using a girdle/tava to cook naan. Plain flour(maida) - 2 cups. Vegetable oil - 1 table spoon. Warm water - ½ cup or as needed. Some plain flour for dusting. Mix flour, salt, baking powder, baking soda, curd, salt and oil in a big bowl. Add warm water little by little and form soft dough. The dough should not be too tight. Keep aside in a warm place for 30 minutes or more if possible. The dough will rise.This will depend of the weather condition too. The dough will rise faster in hot/warm weather. Just before making naan, knead the dough again till it is smooth. Divide the dough in 4-5 portions. Sprinkle a little flour on the board. Place a dough ball on it and pat in a thick oblong or round shape as you like. You can also use a rolling pin if you wish. I usually use a rolling pin. Heat girdle(skillet / tava). Once the tava is hot, keep heat medium. Apply some water to the rolled nan and place it on the tava, wet side down. Cook till you see bubbles forming on the top and the color of the naan changes a little. Turn naan and cook on the other side till light brown spots appear to your liking. You should be using an iron tava for this method and not a nonstick tava. After the watered side has cooked a little and bubbles have appeared on top, you may turn the tava upside down and cook the naan on direct flame. The naan will not fall off as you have used water to stick it to the tava. Keep checking every few seconds how brown the naan is becoming. Cook one side of naan on the tava as instructed in the above methods. Turn and cook the other side for a few seconds on the tava and then hold and place naan on direct flame as you do for phulka. Traditionally nan is cooked in a tandoor oven which is made of clay. Tandoors are available for home cooking. you may use one of those. You may use your electric oven too. Smear a little butter on the naan and Serve with any curry, raita, pickle, bowl of yogurt etc. 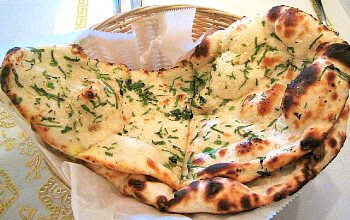 In restaurants, naan is cut in two pieces and served in a wicker basket. The above recipe is the traditional naan recipe using only plain flour(maida). I use whole wheat flour and plain flour together to make it healthier. The time for fermentation may depend on the climate where you live. In warm weather, the dough will rise faster. If the weather is cold, fermentation may take longer. In that case, keep the dough in a warm place. You may wrap something warm around the container of dough such as an old sweater or blanket. 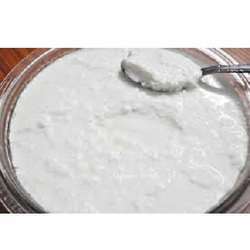 The sourness of the curd (plain yogurt) helps in fermenting the dough faster. Vegans may omit curd and add a little more baking powder. You may use 1 tsp yeast dissolved in warm water for fermentation instead of baking powder if you wish. Bhatura - Indian Fry Bread served with chola - chickpea curry.